home / Multimedia / The Holy Land in news / The Church of the Holy Sepulchre: a restorer’s efforts to .. 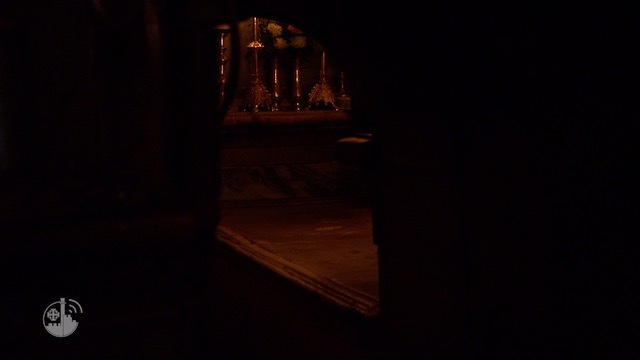 It is the lowest point in the Church of the Holy Sepulchre, located beneath the Chapel of St. Helena, and it is the place where according to tradition Empress Helena discovered the Cross of Christ, together with nails and the titulus, the tablet setting forth in three languages the reason for the condemnation. The walls of the Chapel of the Finding of the Cross preserve faint traces of frescoes that date back to the 12th century. Despite previous restoration efforts, these have been rapidly deteriorating due to humidity, smoke from candles and various other climatic factors, as well as sheer age. Recently, as a result of the labor and passion of an Italian restorer, Maria Cristina Colombo, working under the supervision of ATS pro Terra Sancta collaborators Carla Benelli and Osama Hamdan, and with the logistical coordination of the Bursar’s and Technical Offices of the Custody of the Holy Land, the traces of these frescoes have once again become visible. The works involved a simple cleaning operation, with the soluble salts removed by applying deionized water compresses. As a result, the numerous pilgrims who each day descend the stairs from the Church of the Holy Sepulchre to reach the most subterranean of all of the chapels will now be able to clearly see what remains of this fresco, an ancient testimony of the unbreakable tie that has always bound Christians from throughout the world to this place which, not without reason, is called “the Center of the World”. For more informations about the project “The center of the world”, click here.